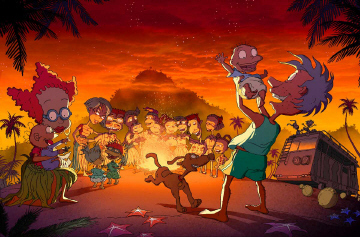 Pictures From "Rugrats Go Wild"
Left: Released 12/20/2002, this is the very first picture from the Rugrats / Thornberrys film -- Spike licks Eliza and Darwin, from the Club Cooltoons Newsletter; © 2002 Viacom. 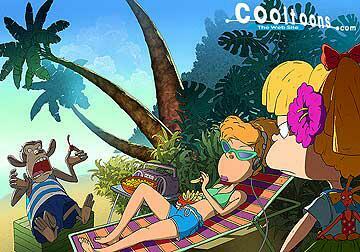 Left: Released 1/17/2003, this is the second picture from the Rugrats / Thornberrys film (not counting the book covers) -- Angelica, Debbie and Darwin, from the Club Cooltoons Newsletter; © 2003 Viacom. 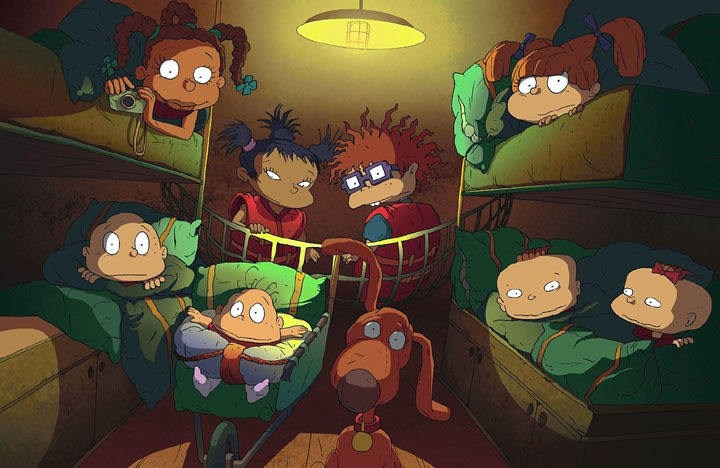 Left: The third picture, featuring the Rugrats, whom they look kind of seasick. Note that they are drawn in the same manner as the Thornberrys, rather than from the Rugrats TV series. From The Z Review and Filmforce; © 2003 Viacom. 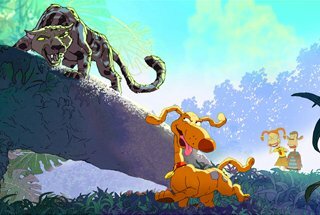 Left: Released 2/21/2003, this picture features Angelica,Eliza, Darwin, Chuckie and Donnie, based on a couple of scenes from the film. 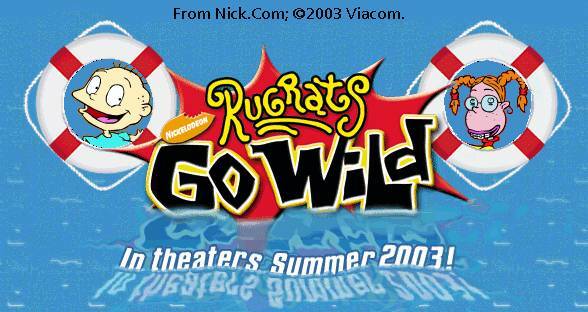 From Nick.Com; © 2003 Viacom. Released around the same time was the first splash picture for Nick.Com's site, which I made some minor alterations to for my own site. The actual splash picture originally featured links to the trailer and the story, where Tommy & Eliza is now. 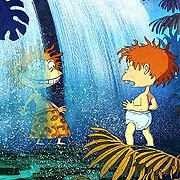 At left here, released on Nick.Com on 4/25/2003, is Chuckie & Donnie, swapping clothes. This picture was used for computer wallpaper that you can download. Here is another picture of Chuckie & Donnie, from the film itself. First published in an article in USA Today on 5/2/2003. And this picture, first released in May 2003, practically spoils the ending, if you know what I mean. From http://modamag.com/ . 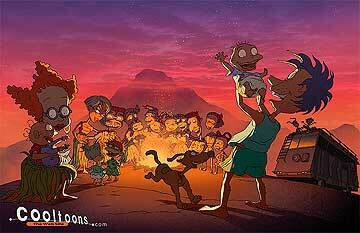 From Cooltoons, here's a different version of that picture, released 5/23/2003. From Nick Jr. here's Spike, who's about to tagle with Siri, a rare but dangerous Clouded Leopard. 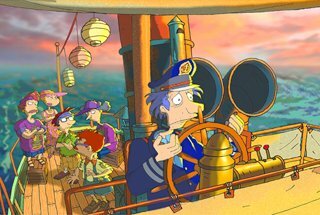 Also from Nick Jr. here's "Captain" Stu and the grownups, on a "luxury" cruise heading towards uncertainty. From Bellaonline, here's a picture of Dil licking Phil's feet, one of many scenes to be featured in "Odorama". This is Nick.com's second splash page for the film's site, which, of course, I appropriated for my site. 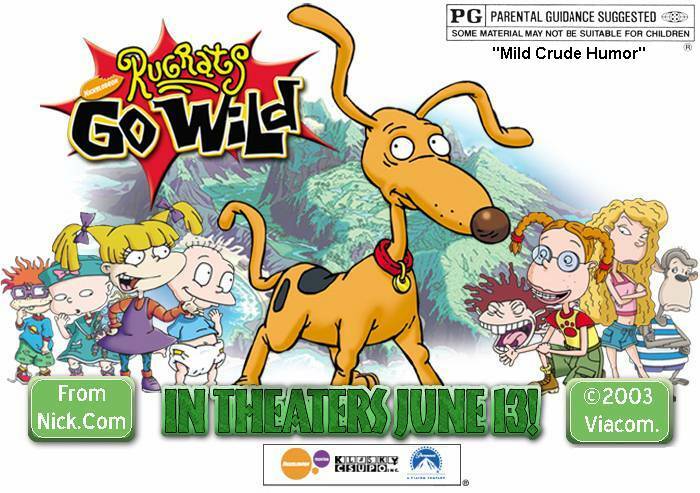 This was used at Nick.Com until May 2003.